Handy touch-ultrabook. 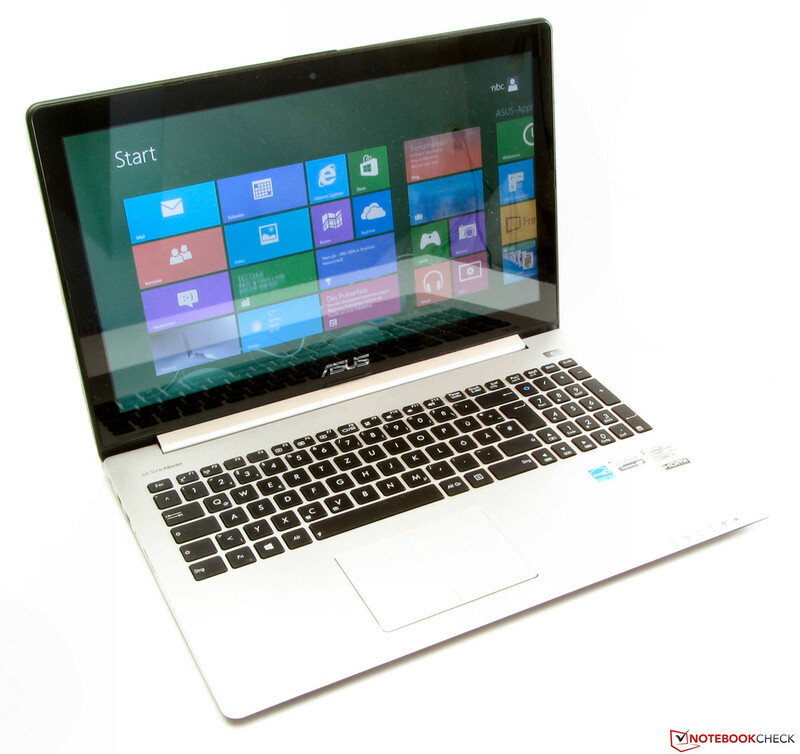 Asus upgrades a simple 15.6-inch office ultrabook with a touchscreen and calls the whole thing Vivobook S500CA. The laptop proves to be quite energy-efficient owing to the ULV processor and is to achieve satisfactory battery runtimes. Whether the Vivobook is compelling can be read in our test report. The number of available laptops and ultrabooks featuring a touchscreen on the market is skyrocketing. Asus want to cater to this market with the VivoBook series, among others. 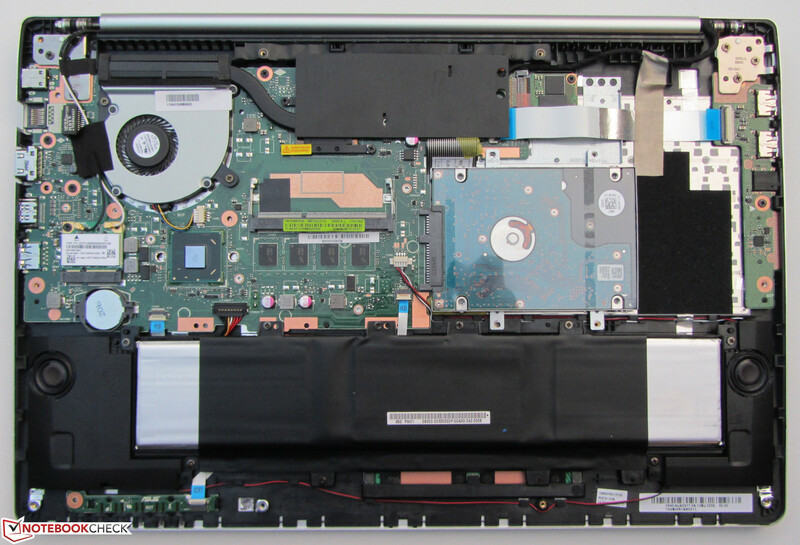 We have tested various laptops - for example the 15.6-inch VivoBook S550CM-CJ038H (Core i5-3317U, GeForce GT 635M). 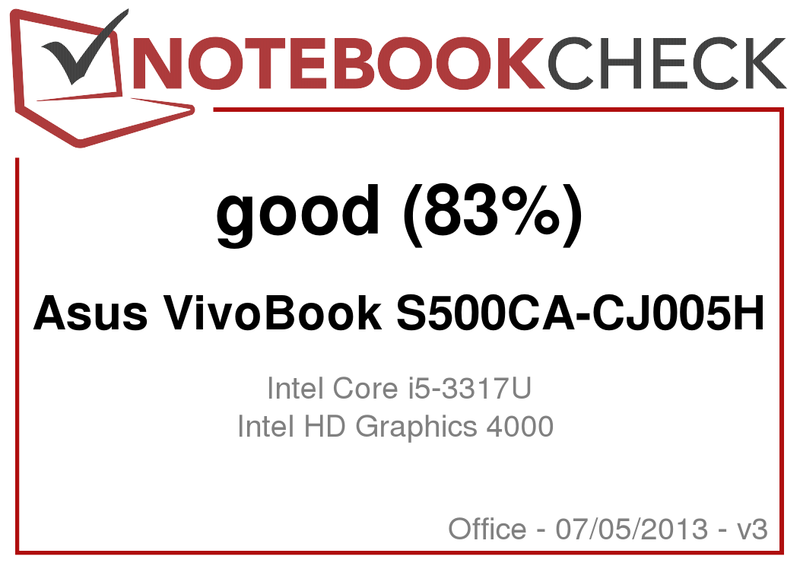 Now another 15.6-inch member dubbed VivoBook S500CA is in our benchmark lab. Although the S550CM and S500CA strongly resemble each other, they only have a few things in common apart from the input devices and their looks. The VivoBook S500CA is based on the same technologies as the recently tested Asus PU500CA-XO002X (Core i5-3317U, HD Graphics 4000). They both are similar in size and feature an identical port distribution. Their relationship is particularly noticed when looking inside. Our test reveals whether the VivoBook is worth recommending. We used HP's Pavilion Sleekbook TouchSmart 15-b153sg (AMD A4-4355M, Radeon HD 7400G) and Acer's Aspire V5-571P (Core i5-3317U, HD Graphics 4000) to help classify the laptop. 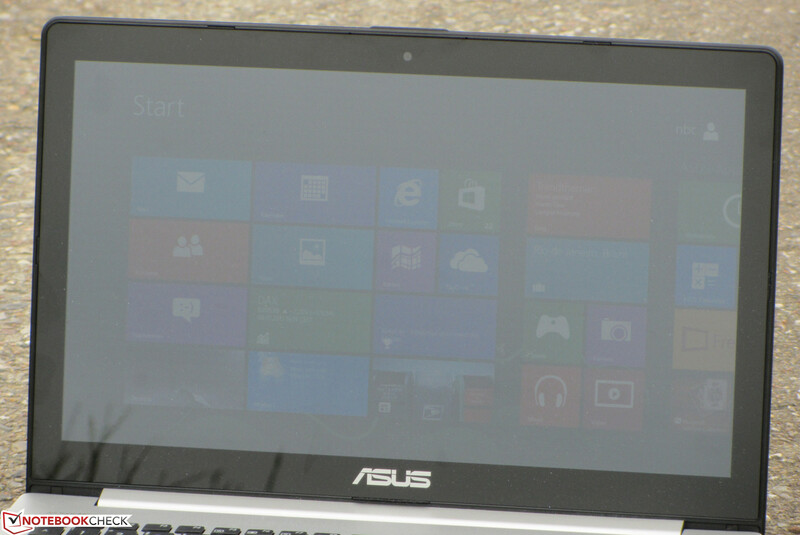 As said above, the VivoBook and Asus PU500CA-XO002X are based on the same technologies. However, there is a difference in the design. The lid's back, the base unit's bottom as well as the display's bezel are matte black. The base unit's upper part is matte silver. 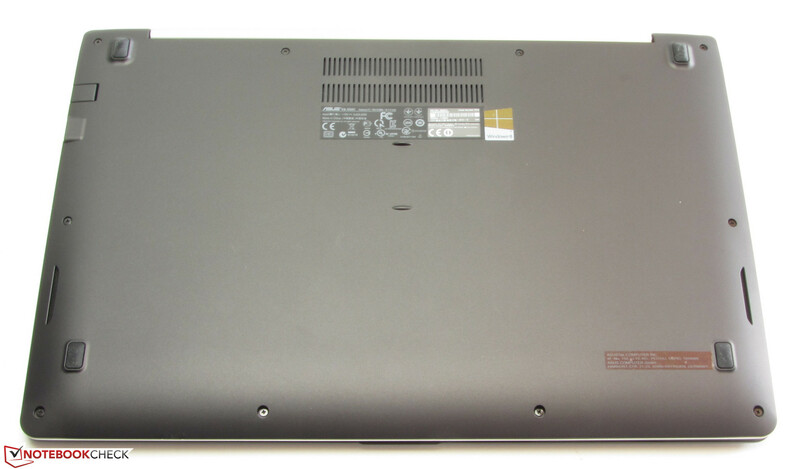 The laptop thus looks a lot like the VivoBook S550CM-CJ038. 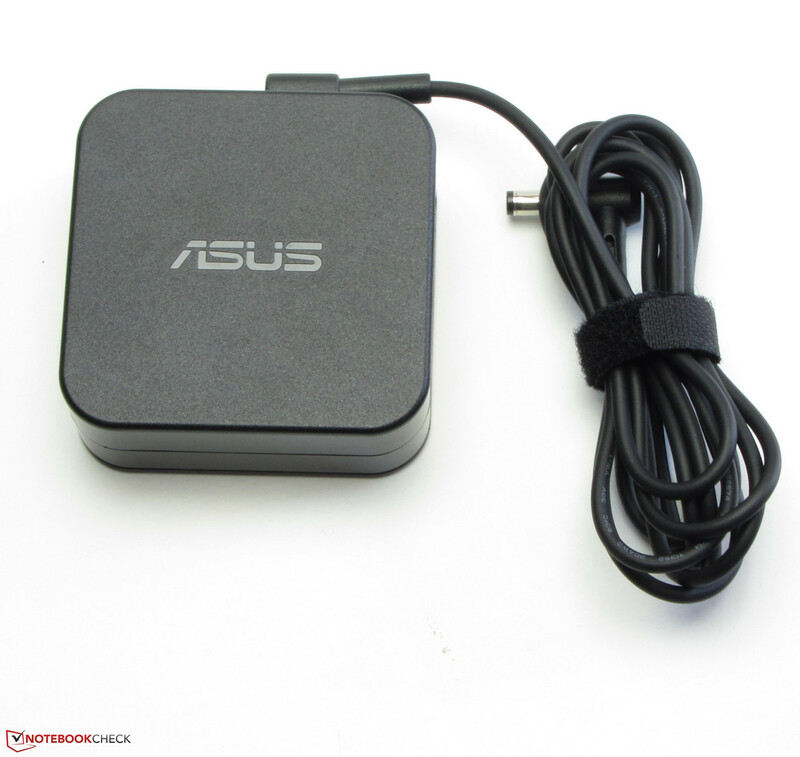 In contrast to the Asus PU500CA, the S500CA is generally rounder. The corners and edges feature a stronger rounding. This is seen most when comparing the casing's bottom tray. Asus has also reduced the VivoBook's height by 1.5 mm compared to the PU500CA, in order to comply with ultrabook specifications. The lid's back and base unit's top of both laptops are made of aluminum. Both the Aspire and Pavilion are completely made of plastic. 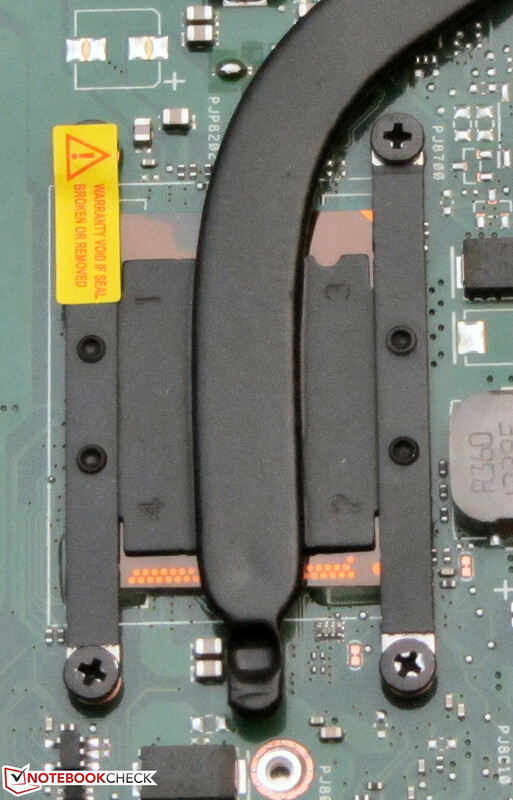 The sturdiness of the base units in both Asus laptops is equal. It proves to be pressure resistant and barely warps. The lid of the S500CA is a bit stiffer than that of the PU500CA. The touchscreen adds stability. The hinges keep the lid firmly in position but allow marginal wobbling after adjustments. The lid cannot be opened with only one hand. The lid and base unit of our review sample do not close evenly. The parts close flush at the base unit's front left corner, but the closed lid is shifted by about 2 mm to the back at the right front corner. We cannot say whether this is only the case for our review sample or an issue that affects the entire series. The three compared laptops feature the most commonly found interfaces installed in laptops nowadays. We were happy to see that all the computers sport USB 3.0 ports. The Aspire has a marginally superior connectivity than its contenders. It is the only laptop that features an optical drive. Users who miss this drive in the VivoBook will find a corresponding alternative in the VivoBook S550CM-CJ038H. Those who own a Pavilion have to live without a VGA port. The port distribution of the VivoBook is good. All ports are in the back areas on both sides. Thus, there are no cords beside the wrist rest. 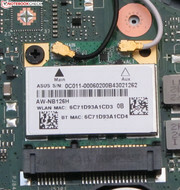 An Atheros module takes care of wireless connections. It supports the Wi-Fi 802.11 b/g/n standard. Wi-Fi reception did not cause any problems. The connection remained stable in both the router's direct vicinity (approx. 3 meters/~10 feet) with a signal of around 50% as well as two stories below its position. 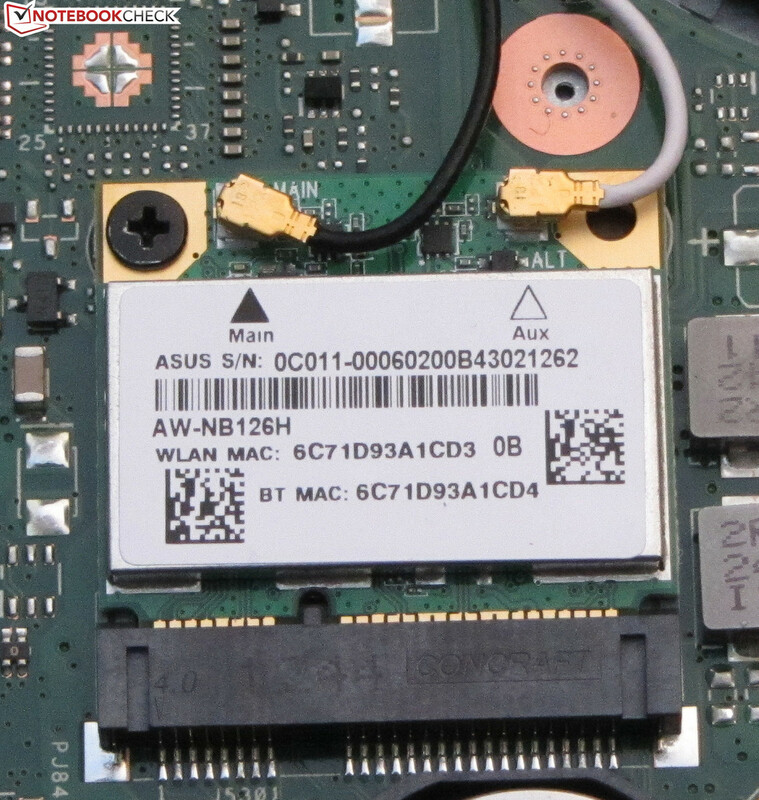 Both the AR8161/8165 Gigabit Ethernet chip and the Bluetooth 4.0 module in Asus' laptop also come from Atheros. 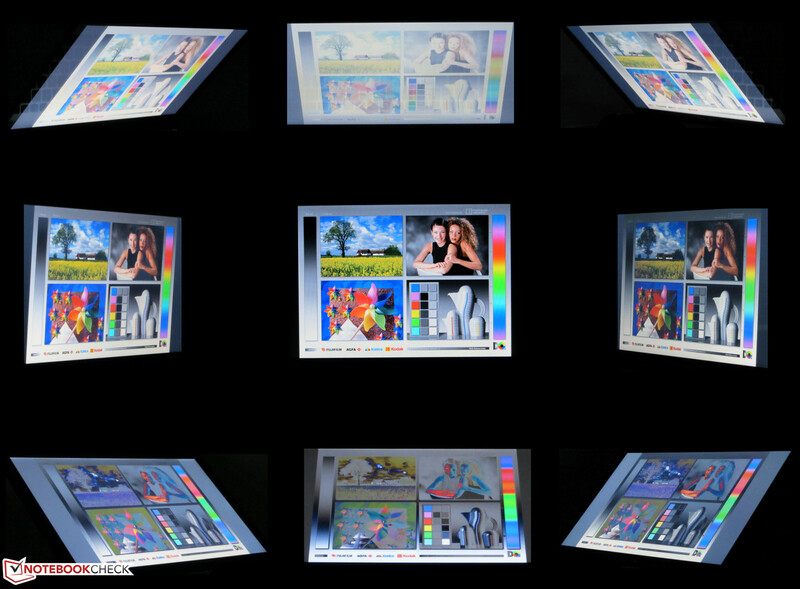 The built-in webcam with a resolution of up to 1280x720 pixels shoots blurry pictures. Apart from a hardware manual and warranty information, the laptop comes with a polishing cloth for the touchscreen. 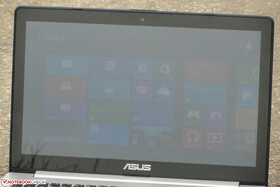 Asus pre-installs Windows 8 64-bit on the VivoBook. A Windows DVD is not included. The system can be repaired in case of an operating system defect or reset to default via Windows 8 recovery system. 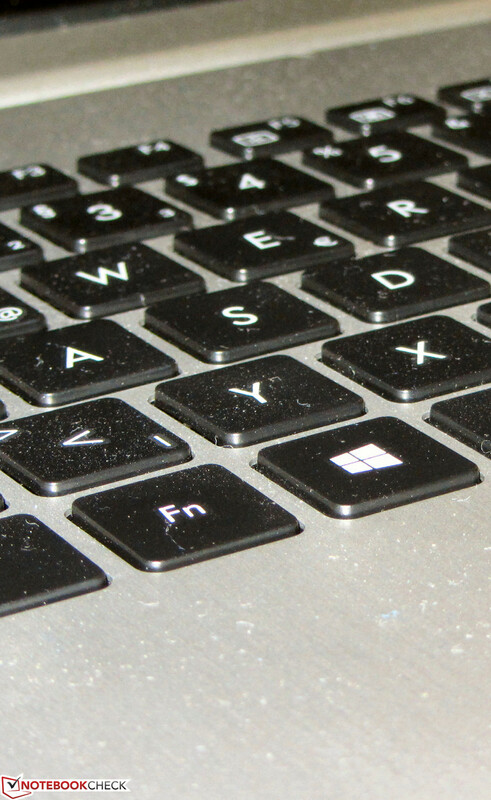 It is opened by pressing the F9 key after turning on the laptop. The base unit's bottom has to be removed in order to access the VivoBook's hardware. This is accomplished by removing all screws from the bottom. The lower tray can then be carefully levered off using a putty knife (from the home improvement center). The bottom tray is secured by plastic hooks that could easily break. 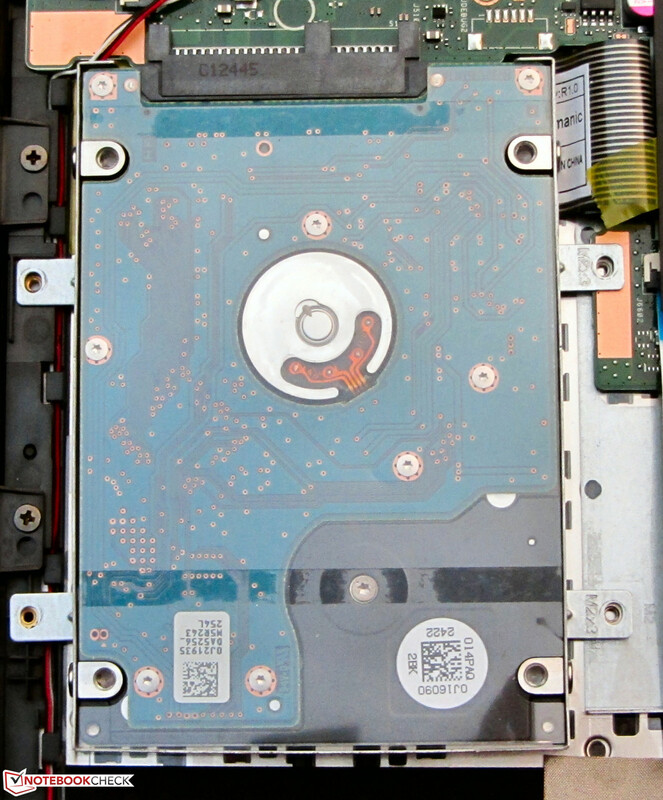 After removing the bottom tray, it is possible to access the working memory, hard drive, Wi-Fi module, BIOS battery, battery and fan. 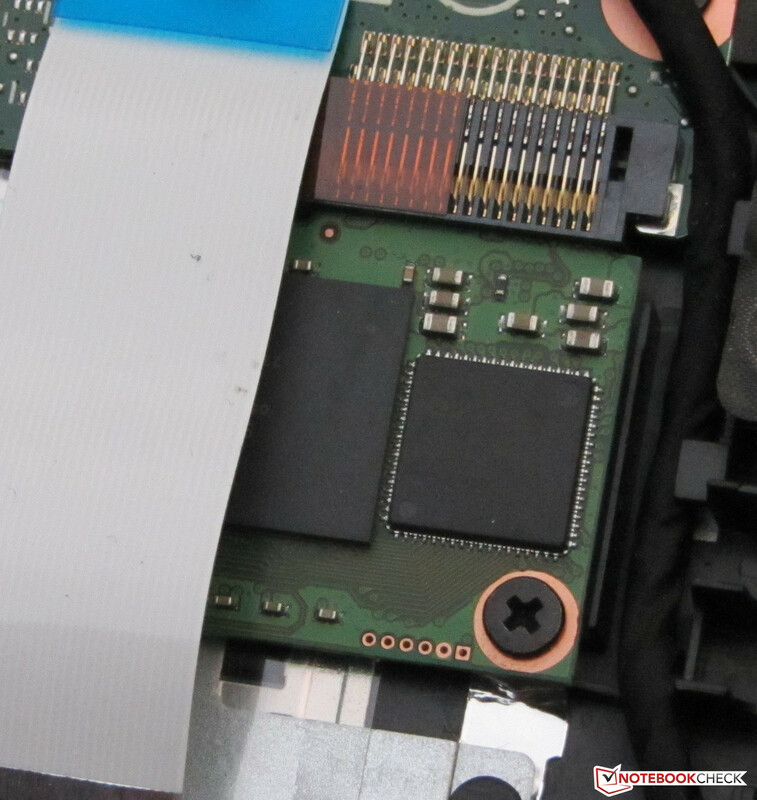 The VivoBook sports four gigabytes of working memory that are soldered to the motherboard. One empty memory bank is available for upgrading the memory. The working memory operates in single-channel mode. The memory could work in dual-channel mode with an additional memory and thus max out the CPU and GPU better. Replacing the hard disk is no problem either. However, only drives with a height of 7 mm fit in the laptop. The battery could also be exchanged in case of defect. It is only secured by screws. The VivoBook comes with a 24-month warranty including pick-up service. The Pavilion and Aspire are delivered with a 12-month warranty to the buyer. 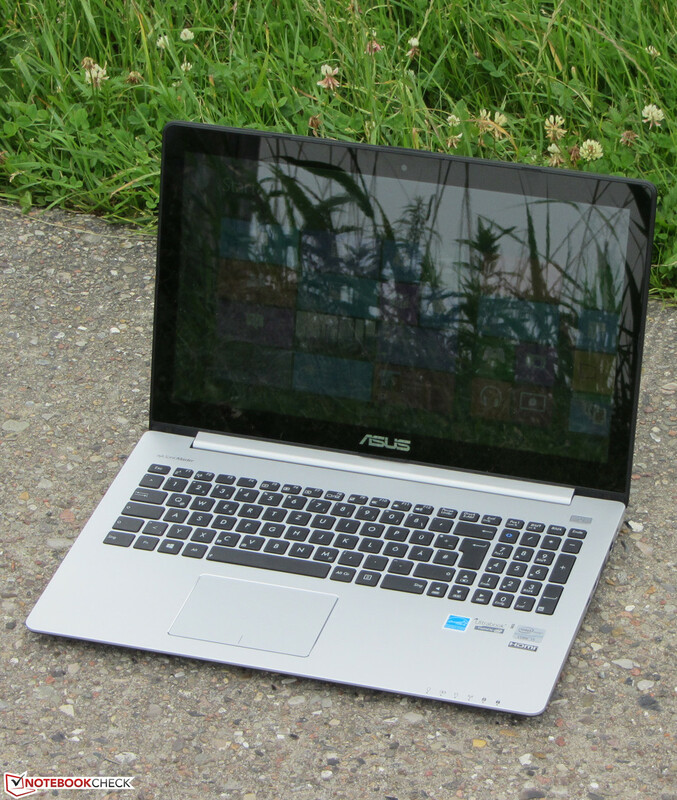 The warranty period of the Asus' laptop can be upgraded to three years. Approximately 80 Euros (~$104) is charged for the corresponding warranty upgrade. 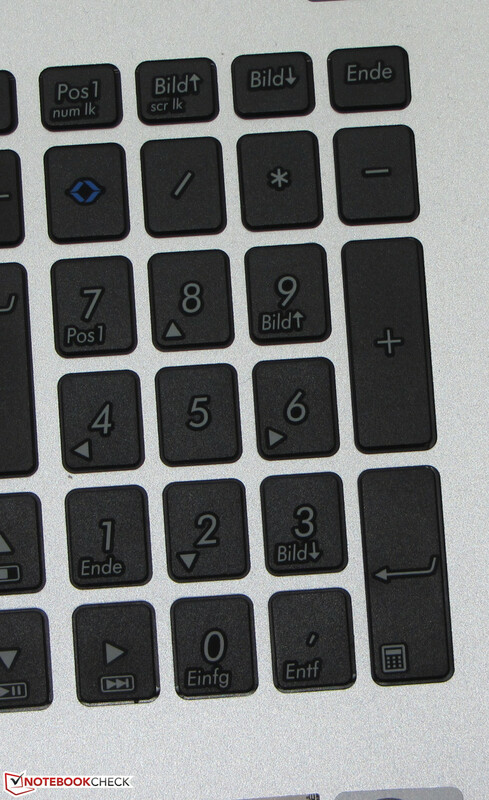 The keyboard, touchpad and touchscreen are identical with those in the VivoBook S550CM-CJ038H version. Thus, we will not deal closely with these components here. The VivoBook features a glossy, 15.6-inch screen. 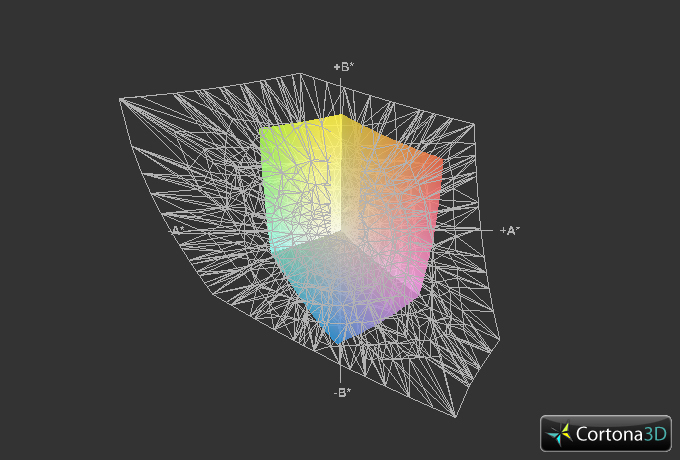 It has a native resolution of 1366x768 pixels. Asus does not offer any other screen models. 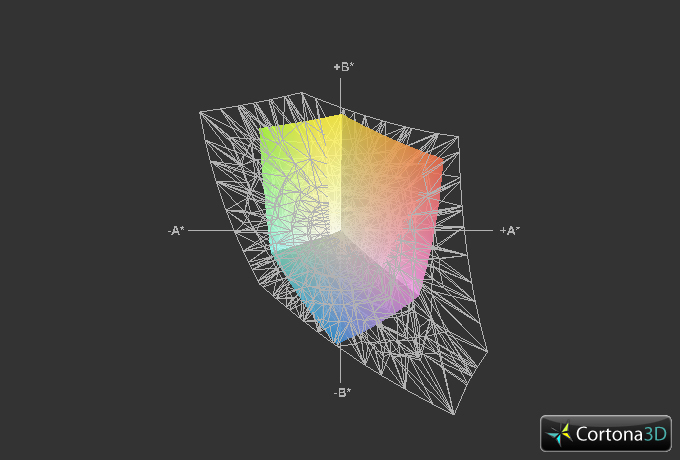 The screen's average brightness of 173 cd/m² is in the lower range. This rather poor rate is even undercut from the screen in the Pavilion (140.4 cd/m²). The Aspire's screen (179.7 cd/m²) is only marginally brighter than that of the VivoBook. Although the screen does not score in brightness, it looks much better with its contrast of 658:1 and black value of 0.27 cd/m². Both rates are within a good range. The Aspire's screen supplies identically good rates (664:1; 0.28 cd/m²) but the Pavilion lags behind the competition (262:1; 0.58 cd/m²). The screen in the VivoBook cannot reproduce either the AdobeRGB or the sRGB color space. We assessed the screen in its default state (target color space: sRGB) and determined clear DeltaE 2000 deviation in almost all colors. The deviations were at a rate of around 10. Only a few colors clearly surpassed this rate. Black and white were the only colors within the target range (DeltaE smaller than 5). The screen has a visible bluish cast. The VivoBook is useless outdoors. The low brightness and reflective screen do not allow working outdoors. The screen's good contrast ratio does not help here either. The viewing angle stability is as we expected from a laptop of this price level. Changing the vertical viewing angle quickly leads to picture distortions. The horizontal viewing angles are more generous and the screen can be read from the sides. However, the picture dims slightly. 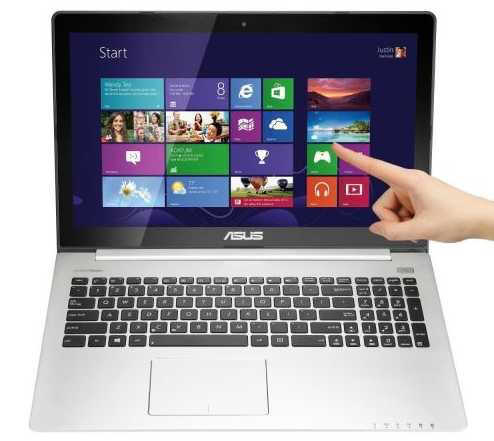 Asus offers a slim and handy 15.6-inch office touchscreen ultrabook in the VivoBook S500CA. The hardware configuration enables performing the most common application scenarios, such as Internet browsing, word processing, Internet communication or even playing videos. Our review sample is sold for starting at around 700 Euros (~$913). 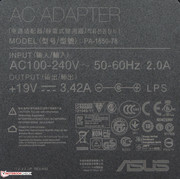 Asus also offers other configurations in the S500CA series. The differences are mainly found in the installed processor and working memory capacity. The VivoBook is currently available with the following processors: Core i3-3217U, Core i5-3317U, Core i5-3337U, Core i7-3517U and Core i7-3537U. The various models range from 600 Euros (~$783) to 800 Euros (~$1044). Intel's Core i5-3317U is installed as the central processing unit. The dual-core CPU is an offshoot of the Ivy Bridge processor generation and clocks with a default rate of 1.7 GHz. Its speed can be boosted to 2.4 GHz on both cores and 2.6 GHz on one core only via Turbo. It is a ULV processor. These models can be operated with low voltage and they thus consume a relatively small amount of power. Intel specifies a TDP of 17 Watts for the Core i5. 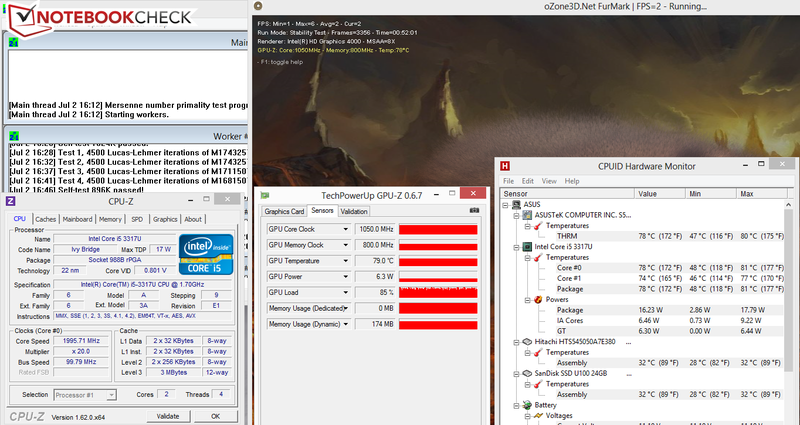 The CPU processed the Cinebench benchmark CPU tests at full speed (2.4 GHz). One core was occasionally boosted to 2.6 GHz in the single-thread tests. The scores of the Aspire (Core i5-3317U, HD Graphics 4000) are on a par with the VivoBook. Both laptops sport the same processor. The Pavilion (AMD A4-4355M, Radeon HD 7400G) cannot keep up with either contender. AMD's processor is clearly inferior to its Intel counterpart. The VivoBook also supplied the best results in the GL tests. The Aspire slightly lags behind the VivoBook in the GL tests. The graphics processor in Acer's computer apparently does not clock at full speed. The Pavilion can at least keep up with the competition in the Cinebench R11.5 GL benchmark. It is very clearly inferior in the Cinebench 10 benchmarks. There is no reason for criticizing the system performance. The system runs without interruptions and applications open immediately. The scores of both PCMark benchmarks are accordingly good. The scores of the Aspire (Core i5-3317U, HD Graphics 4000) lag behind the VivoBook's. Nevertheless, the comparison of both laptops is interesting because the CPU, GPU, working memory and hard drive are identical. The main difference between both laptops is the VivoBook's 24 GB SSD cache. Approximately 20% better scores are possible due to the VivoBook's cache. The scores of the Pavilion (AMD A4-4355M, Radeon HD 7400G) lag far behind those of its contenders. The VivoBook's scores could be even higher. 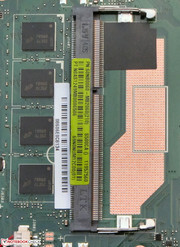 We inserted a 4 GB working memory module in the laptop, which allows the working memory to operate in dual-channel mode. The CPU and GPU can be used more efficiently. The PCMark 7 score increased by almost 13% to 3174 points. Installing a solid state drive is even more effective. Our 64 GB Crucial RealSSD C300 solid state drive increased the PCMark 7 score by approximately 46% to 4117 points and PCMark Vantage by roughly 68% to 10774 points. The hard drive in the VivoBook comes from Hitachi's Travelstar Z5K500 range. It has a capacity of 500 GB and spins with 5400 revolutions per minute. The hard drive is supported by a 24 GB SSD cache from SanDisk. CrystalDiskMark recorded a read speed of 92.04 MB/s for the HDD-SSD array. HD Tune delivered an average transfer rate of 85.7 MB/s. Those are not particularly good rates for an SSD-HDD array. However, these rates would be good when only a hard drive without SSD cache support were installed. Intel's HD Graphics 4000 GPU is responsible for video output. The graphics core supports DirectX 11 and clocks with speeds ranging from 350 to 1050 MHz. The VivoBook and Aspire (Core i5-3317U, HD Graphics 4000) are virtually on a par in the different 3DMark benchmarks. After all, both laptops feature the same CPU-GPU combination. The Pavilion (AMD A4-4345M, Radeon HD 7400G) cannot compete with the competition in these benchmarks either and provides the lowest scores. The Pavilion not only sports the weakest CPU but also the weakest GPU. As we described in system performance, the system's power can be improved by using a second working memory module because the working memory then operates in dual-channel mode. The same is true for the graphics power. The 3DMark 11 score can be increased by about 13% to 629 points via the dual-channel mode. The VivoBook is not a laptop for gamers. The computer manages to render a few up-to-date 3D games in low resolution and quality smoothly on the screen. Games, like the FIFA series, should also run smoothly in the screen's native resolution and medium quality level. As we just said, the graphics power can be increased by installing a second working memory module. This is also noticed in games. When the working memory operates in dual-channel mode, the frame rates are approximately 5 to 20% higher (depending on the game). A comparison between the frame rates of the VivoBook and Asus PU500CA-XO002X shows how much higher the frame rates are when operating in dual-channel mode. The plus was even a bit over 20% in the games we tested. Another laptop is needed when more gaming power is wanted. 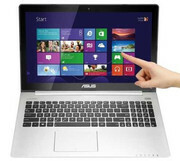 Users who want a touchscreen could find an alternative in Asus' VivoBook S550CM-CJ038H (Core i5-3317U, GeForce GT 635M). A version of the Aspire V5-571P (Core i5-3317U, HD Graphics 4000) is also available with a dedicated GPU. Disregarding ultrabooks and touchscreens, Acer's Aspire V5-571G (Core i7-3610QM, GeForce GT 640M) or Dell's Inspiron 15 (Core i5-3337U, Radeon HD 8750M) could come in question. The VivoBook sports an energy-efficient ULV processor. 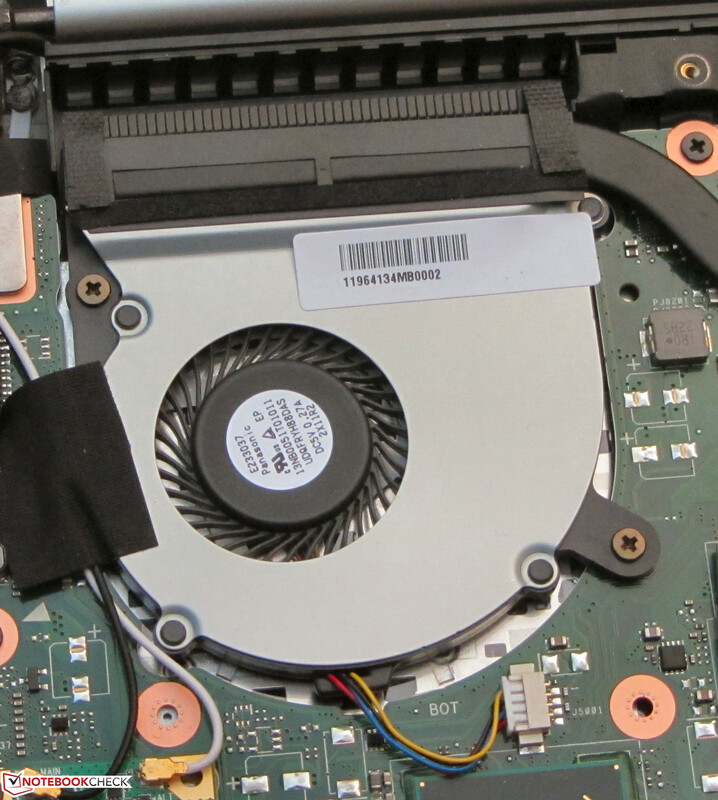 Thus, there is not much cooling effort necessary and the laptop works quietly when idle. We measured a noise level of 30.2 to 31.1 dB(A). These rates are undercut by the Aspire (30.5 to 30.8 dB(A)) and from the Pavilion (29.6 dB(A)). The VivoBook does not produce much noise in medium load via 3DMark06 with 34.4 dB(A) or in full load during the stress test via Prime95 and FurMark with 36.6 dB(A). The Pavilion's rates are only slightly higher with 34.9 and 38.3 dB(A) and the Aspire is much louder with 36.9 and 42.2 dB(A) in full load. The casing's idle temperatures are within an acceptable range. We ascertained temperatures ranging from 24.4 to 34.8 degrees Celsius (75.92 to 94.64 Fahrenheit). The casings of the Pavilion (25 to 31.2 degrees Celsius/77 to 88.16 Fahrenheit) and the Aspire (21.8 to 33.2 degrees Celsius/71.24 to 91.76 Fahrenheit) are a bit cooler. During full load, the VivoBook's temperatures increase moderately to 23.5 to 42.4 degrees Celsius (74.3 to 108.32 Fahrenheit). The Aspire (24.2 to 38 degrees Celsius/75.56 to 100.4 Fahrenheit) is slightly below that. The reason for this is that the processor and GPU do not clock at full speed. The temperatures of the Pavilion are somewhat higher than its contenders (26.5 to 41.2 degrees Celsius/79.7 to 106.16 Fahrenheit). The processor performed our stress test, where Prime95 and FurMark run for at least one hour, with 2 to 2.1 GHz for the first five minutes. Afterwards, it stably clocked at 2 GHz. The stress test started with 2 GHz from the outset in battery mode. The GPU clocked at full speed with 1050 MHz in both AC mode and battery mode. The CPU's temperature settled to approximately 78 degrees Celsius (172.4 Fahrenheit) in AC mode. (+) The average temperature for the upper side under maximal load is 29.1 °C / 84 F, compared to the average of 29.4 °C / 85 F for the devices in the class Office. (+) The maximum temperature on the upper side is 37.9 °C / 100 F, compared to the average of 33.9 °C / 93 F, ranging from 21.2 to 62.5 °C for the class Office. (+) In idle usage, the average temperature for the upper side is 29 °C / 84 F, compared to the device average of 29.4 °C / 85 F.
(+) The palmrests and touchpad are cooler than skin temperature with a maximum of 27.5 °C / 81.5 F and are therefore cool to the touch. (±) The average temperature of the palmrest area of similar devices was 28.2 °C / 82.8 F (+0.7 °C / 1.3 F). 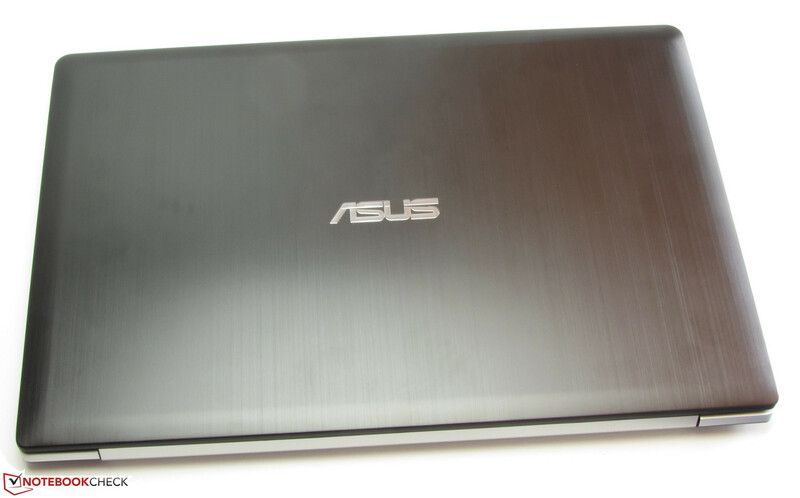 The stereo speakers in Asus' laptop are located in the casing's front bottom area on both sides. They produce a rich sound that lacks bass. The sound is acceptable and it is possible to listen to the speakers for a long time without torturing the ears. External speakers or headphones boost the sound experience considerably. We ascertained an idle power consumption ranging from 7.1 and 12.8 Watts. These rates are acceptable for a touchscreen ULV ultrabook. The rates from the Pavilion are even a bit lower with 6.9 to 10.1 Watts. The Pavilion proves to be even more energy-efficient during medium load via 3DMark 06 with 26.6 and full load in the stress test via Prime95 and FurMark with 29.3 Watts. The VivoBook consumed 31.7 and 32.4 Watts here. The VivoBook achieved a runtime of 6:55 h in idle mode. Thus, it lasts over two hours longer than the Aspire (4:48 h) and the Pavilion (4:46 h). Idle mode is ascertained via Battery Eater Reader's test using minimum screen brightness, enabled energy-saving mode and disabled wireless modules. The VivoBook ran for 1:17 h during load. The Aspire is on a par with 1:14 h. The Pavilion surpasses two hours with 2:04h. The Battery Eater Classic test is used for determining the load runtime. The screen is set to maximum brightness, the high-performance profile and the wireless modules are enabled for this. A full battery kept the Wi-Fi test running for 3:44 h. Both the Aspire (2:59 h) and the Pavilion (3:09 h) are drained sooner. Websites are opened automatically every 40 seconds, the energy-saving profile is enabled and the screen brightness is set to approximately 150 cd/m² for this test. 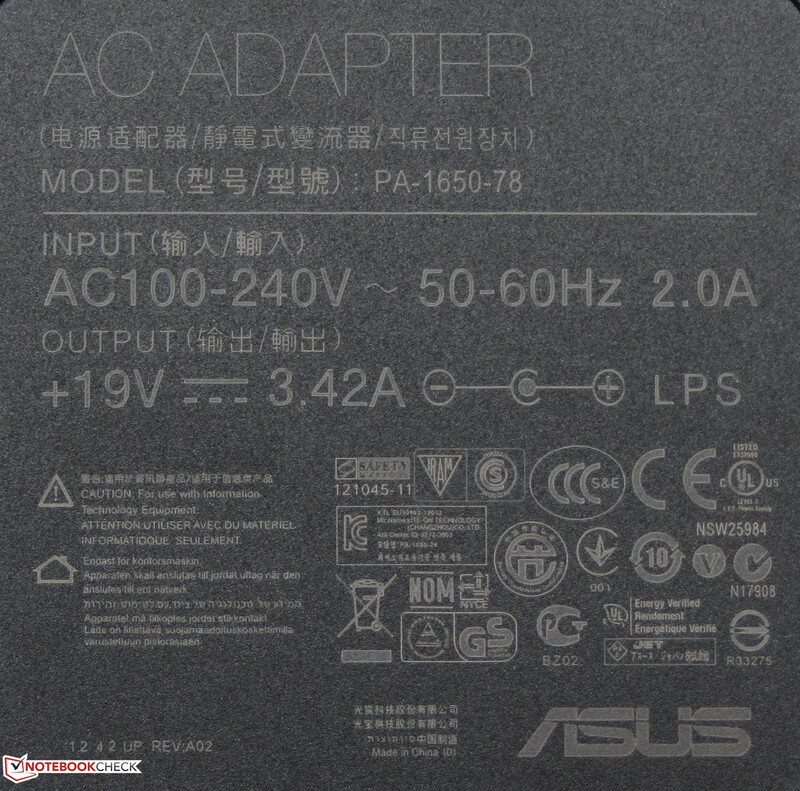 The runtimes of the three devices can only be compared to an extent since their batteries all have a similar capacity (Asus: 44 Wh; HP and Acer: 37 Wh). As in the Asus PU500CA-XO002X, the VivoBook's battery runtimes are not exceptional. 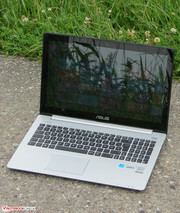 We would expect more from a ULV ultrabook, particularly considering the price of around 700 Euros (~$913). Acer proves that building an affordable ultrabook with high battery capacities and long runtimes is possible with its Aspire M3-481 (Core i5-3317U, HD Graphics 4000, 14-inch). Its 54 Wh battery ensures much better runtimes (Wi-Fi test: 5:57 h; idle: 11:18 h). It also sports a DVD burner and is sold for less than 500 Euros (~$652). Asus' VivoBook S500CA provides a decent application performance and always works quietly. It comes with a satisfactory keyboard and with a 24-month warranty. The entire technology is packed in a sturdy and attractive casing. The VivoBook's screen compels with its good contrast but only achieves a low brightness at the same time. The overall battery runtime is not bad although we would have expected more from an ultrabook. A significant issue is also the price. The laptop is not exactly cheap costing around 700 Euros (~$913). Asus should have more to offer for this price, e.g. a bigger battery, better screen and/or a backlit keyboard. Users who are satisfied with the power of a Core i3 can obtain the VivoBook for 620 Euros (~$809). HP's Pavilion Sleekbook TouchSmart 15-b153sg is ideal for users who want to spend as little as possible for a touchscreen laptop. It is currently available for 400 Euros (~$522). 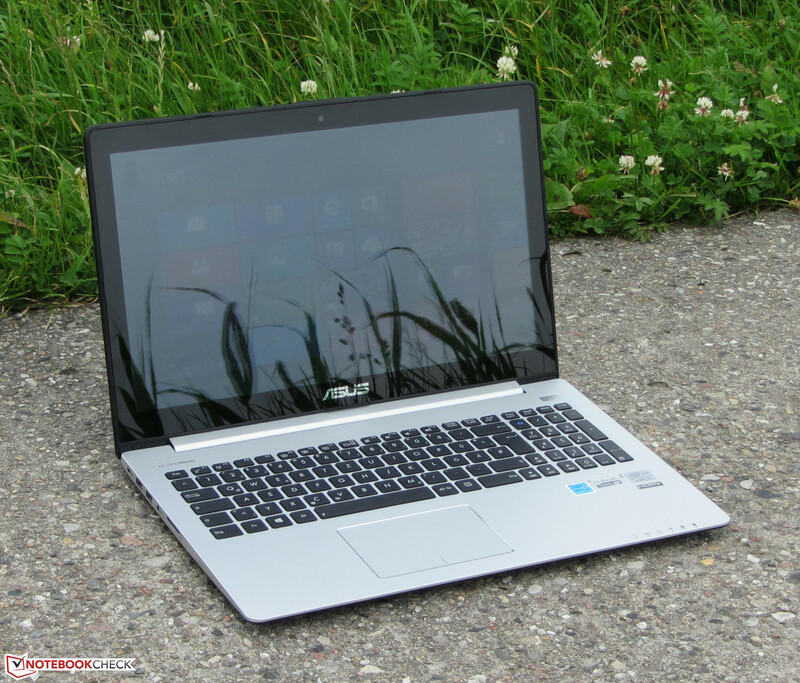 Acer's Aspire V5-571P is a possible alternative when as many options as possible is wanted. 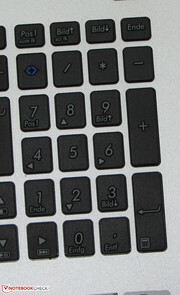 The laptop is available in innumerable configurations, i.e. different CPUs, with and without touchscreen, with and without a dedicated GPU. The model we tested is sold for around 600 Euros (~$783). A number pad is installed. The hinges keep the lid firmly in position. 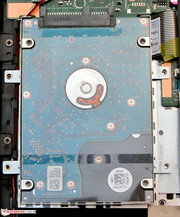 Accessing the hardware is possible after removing the bottom tray. Four gigabyte of working memory are soldered. A memory bank is present. Replacing the hard drive is easy. 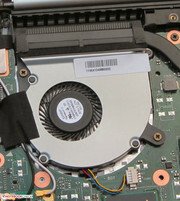 The fan can be taken out for cleaning purposes. The processor is soldered to the motherboard. Asus treats the laptop to an SSD cache. Good: Two Wi-Fi antennas are installed. 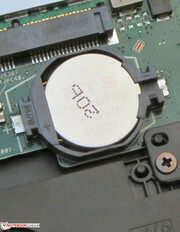 The BIOS battery could be exchanged. 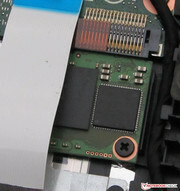 Replacing the battery is also possible. 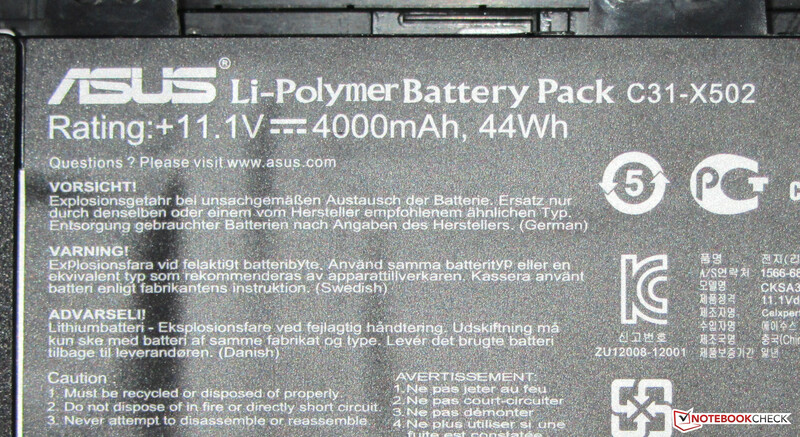 The battery has a capacity of 44 Wh. ...and provides a maximum of 65 Watts. The waste heat is discharged here. The speakers are on the bottom. 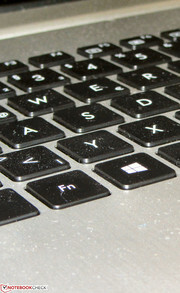 The keys feature a short drop. The decent application performance and quiet operating noise. The casing is also nicely designed. A brighter screen and longer battery runtimes. 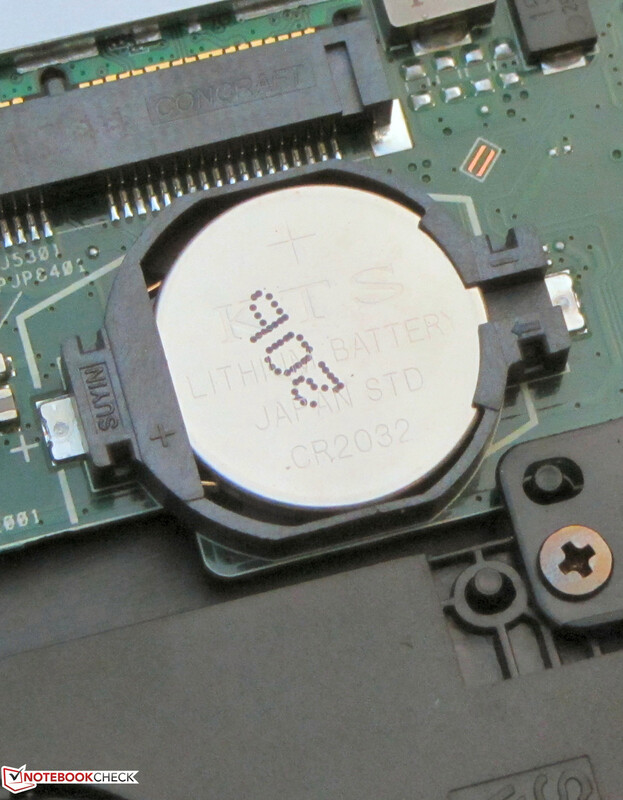 Although the laptop sports ULV hardware, its battery runtimes are on the same level as most laptops with standard mobile processors.